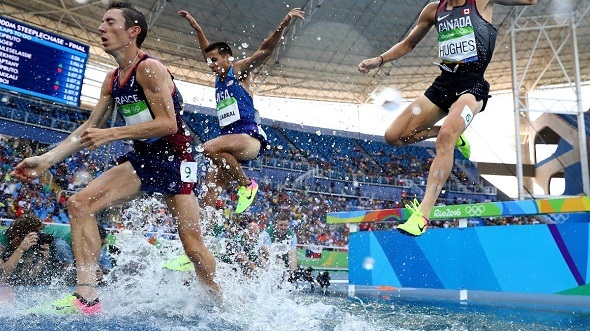 Donn Cabral had goals of placing better in the Olympic finals of the steeplechase than he did in the London Games, where he had finished eighth. Step one was making it to the finals, which he did earlier this week. Step two was making sure to race and finish. That he did. From the gun, Cabral stayed on the back of the pack, allowing Kenya’s Conseslus Kipruto and USA’s Evan Jager to set the honest pace. Slowly, the pack spread out and mini-groups were formed. Cabral started to move up once the race was halfway complete, slowly picking off his fellow competitors. But medal contention was way out of reach as defending Olympic champion Ezekiel Kemboi, Kipruto, and Jager pulled away from the field, as Kipruto won the gold in a new meet record of 8:03.28 while Jager made American history by grabbing silver over Kemboi (bronze). Cabral picked off a few people on the final lap and had to hold off a late charge from Brazil’s Altobeli Da Silva. Cabral finished eighth in the field with 8:25.81, tying his London placing (note – Cabral was originally 10th but two athletes were later DQed, one of which was Kemboi). Kate Grace executed her 800m preliminary race like she had executed her recent 800m races – wait in the back until the 600m point and then make her move. This time, she needed to go out wide in the final 100m in order to pass the runners ahead of her, crossing the line in lane 3 but steps out of automatic qualification for the next round (top 2 advanced from each heat). She needed to wait until all of the heats were done to see if she was one of the at-large qualifiers as her 1:59.96 had placed her seventh of the eight possible qualifiers. Fortunately for her, the time held and she will race in the semi-finals later this week. Conor McCullough and Rudy Winkler did not advance out of the hammer preliminaries this morning as neither athlete finished in the top 12 among all of the qualifiers or hit the automatic advancement mark of 76.50m. Winkler only had one legal throw of the morning – a distance of 71.89m –that placed him 18th in the overall standings. McCullough’s best distance came on his final throw – 72.88m – that placed him 16th overall and the top American in the field. Two HepsNation athletes will compete tonight. Bruno Hortelano will compete in the men’s 200m semifinals tonight starting at 9pm. He will be in the third heat, where he will line up against USA’s Justin Gatlin, Jamaica’s Yohan Blake, and Netherlands’ Churandy Martina. Top 2 in each heat and then the next 2 fastest will advance to the finals. Hortelano will need to set a new personal best again if he wants to be in contention for the finals. It will likely be the same situation for Sean Furey as he will throw in Group B of the javelin preliminary round, starting at 8:55pm ET. To advance to the finals, he will need to surpass 83 meters (which he has done once before) or finish in the top 12 across all competitors. You can follow the live results here. This entry was posted on Wednesday, August 17th, 2016 at 4:07 pm. It is filed under Olympics, Spotlight. You can follow any responses to this entry through the RSS 2.0 feed.